A year ago today, I shot across France, from Paris to Lyon, on a bullet train with my friend Houston. Destination: Paul Bocuse, the legendary (and longest-standing) three Michelin-starred restaurant. Our Santa Claus was Monsieur Bocuse. Though not quite jolly, he was be-toqued, pear-shaped, rosy-cheeked, and bore lots of delicious goodies for us, including one of my favorite desserts. I didn’t recognize the baba au rhum at Paul Bocuse at first. Traditionally, they’re shaped like an oversized cork. The one at Bocuse looked more like a yeasty, cream-filled doughnut bun. But one spoonful of the soft, fluffy cake saturated with sticky booze and I realized I was eating one of the most fantastic babas I had ever had. I scoured cookbooks at my disposal and canvassed the internet for Monsieur Bocuse’s baba recipe. I couldn’t find it (if someone has it, I would appreciate a copy). Julia Child’s recipe turned out fine. But the texture was stodgy, and dense (not enough butter and eggs in my opinion, if you can imagine). So I turned to a more widely-published chef who I know makes very good baba – Alain Ducasse. I found his famous baba recipe in Great, Grand, and Famous Chefs and Their Signature Dishes. With nearly double the amount of eggs and butter as Child’s recipe, this recipe seemed like it would produce the soft, delicate crumb that I witnessed in Ducasse’s version of baba that I had at the miX in Las Vegas. And, the fact that this recipe dispensed with a double rising of the dough, favoring a simple sponge instead, was a bonus this impatient home cook. As published, the recipe was a bit rough. I played with it a bit and edited it for clarification and to suit my needs. I adjusted the baking time and, because I like mine extra boozy, I increased the amount of rum. Be sure to use a dark rum, preferably, Jamaican. Use it sparingly – it’s Christmas! Make sure your eggs are at room temperature before you begin this recipe. Also, it is important that you do not scald the milk – heat it gently in a double boiler just until the milk is slightly warm to the touch. 1. Preheat the oven to 350 F. Butter the baba molds. 2. In a large stainless steel bowl, combine the yeast and milk. Set the bowl over a medium saucepot filled with an inch of simmering water. Stir the milk and yeast mixture to warm it slightly – it should be the faintest bit warm to the touch. Do not scald the milk. When the milk is warm, turn off the heat and remove the the bowl from the saucepot and stir in 1/4 cup of sifted flour into the milk mixture, cover and set in a warm place for 20 minutes. 3. Beat the butter with the sugar and 2 tablespoons of flour. Add the eggs, one at a time, and beat well. When the yeast dough has risen and becomes spongy, whisk in the butter mixture plus the remaining 1 1/4 cups of flour to make a thick, dough-like batter. 4. 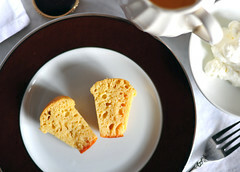 Spoon the batter into the greased baba molds and bake for 12-14 minutes for mini babas, 20-25 minutes for larger molds. The babas are done when they have risen and taken on a golden dome and have started to pull away from the sides of the mold slightly..
For the Rum Syrup: Split the vanilla bean in half, lengthwise. Scrape the seeds into a medium saucepan along with the pods and add the water and sugar. Bring the mixture to a boil over high heat and remove from heat. Stir in the orange peel and set the pot aside to cool. Add the 3/4 cup of rum. While the babas are still warm, dip them in the syrup, leaving them in for a few minutes to saturate. Transfer the babas to a sheet pan (or wire rack placed over a sheetpan). When cool, brush the cakes with warmed, strained apricot jam if so desired. To serve: Split the babas lengthwise, spoon more rum syrup over the cakes as desired, and top with whipped cream. ~ by ulterior epicure on December 25, 2009. Oh my, your descriptions of this cake are so evocative! We’re celebrating holiday favorites on this month’s Shine Supper Club, and your recipe would be a perfect addition. Hope you’ll join us!